I was recently drawn to this interesting graphic posted to Flickr by NMK’s Ian Delaney. It illustrates the fragmentation of people’s media consumption over recent decades. So what should I find when rummaging about in the garage earlier this week, but this rather dog-eared yellow card, 148mm x 210mm. Old media indeed. Ah, but it’s so much more than that. Among other things, Thatcher made savage cuts to higher education funding and exactly twenty years ago, our department was threatened with closure. We, students and faculty, fought back. We organised ourselves. As the winter break approached, we vowed not to lose touch, despite physically dispersing around the globe. What tools were available to us back then, twenty years ago? The Telephone. Simple as that. So the “Save DEV” telephone tree was born. It was this that I stumbled upon in the garage on Monday. 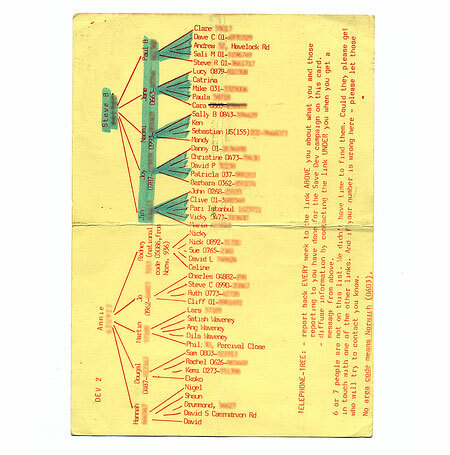 View a larger version of the telephone tree. But I mention this, not for old times’ sake, but because I recall what it was like to run a campaign (as I subsequently did for Oxfam) without the tools that are now available to us – to blog, to tag, to video, and so on. Part of my motivation for starting this blog was this memory (“if only we’d had these tools back then…”). But we still networked. Quite effectively, actually (we saved our department). It’s just easier now to make connections, and join existing ‘conversations’ we would never have known about before. Thinking about it, I guess the computer revolution really coincided with the Thatcher regime (I still like to call it that). 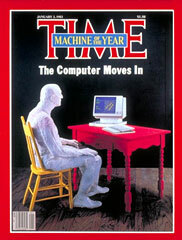 In 1982, TIME magazine selected ‘The Computer’ as its “Man of the Year”. In 2006, it picked “You”. The Machine is now Us. I guess that symbolises just how far we’ve come. Or have we? I notice that one of my lecturer’s, John Cameron, is still there. Must get in touch. And with all the others. By email. Where are they now, I wonder? Can we reconnect the network… via the internet… which is, after all, the same old network of people.